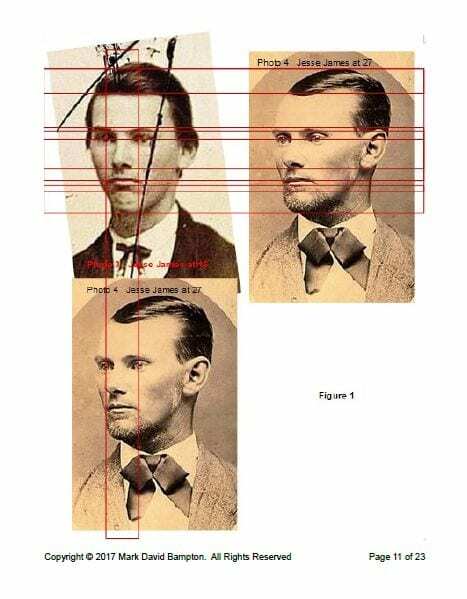 Forensic science now impugns an ambrotype image claimed to be Jesse Woodson James. The forensic report concludes the image is not America’s iconic historical figure at all. 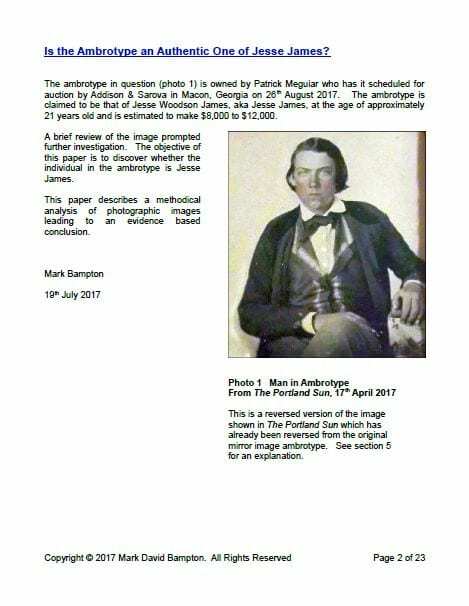 A forensic science paper titled “Analysis of an Ambrotype to Find Out if it is an Authentic Image of Jesse James” was written and published by Mark David Bampton, a native of Great Britain. The paper first appeared on Academia.edu, and now is republished in its entirety below with permission. Applying his knowledge of forensic science acquired over many years, Mark Bampton has made a name for himself in the U.S. as a forensic analyst of historical photographic images. 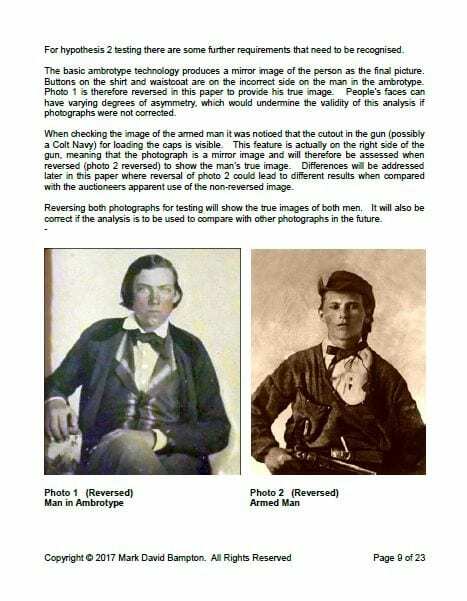 His masterful forensic debunking of the Bob Ford/Jesse James photo hoax definitively lay to rest a claimed Jesse James tintype image as being a fraud. Most recently, Bampton garnered more distinction when he applied his forensic science skills to an image claimed to be famed Mississippi blues man Robert Johnson. American musicologists who engaged the controversy beforehand have coalesced in the end behind Bampton’s meticulous analysis. 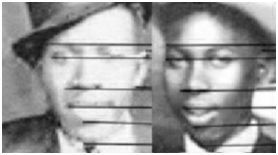 In the case of the Robert Johnson image, Bampton’s analysis went beyond facial recognition alone so far as to scrutinize the hands of the blues artist. Ambrotype appearing in Bampton’s town newspaper the Portland Sun, April 19, 2017, claimed by its owner Patrick Taylor Mequiar to be Jesse Woodson James. Now the subject of forensic analysis. The present ambrotype claimed to be Jesse James is owned by Patrick Taylor Meguiar. He has consigned the artifact for auction to Addison and Sarova, an antiquarian book dealer in Georgia. Prior to consignment, Meguiar’s artifact and claim raised a host of red flags. When Meguiar sought the opinion of his artifact from the Jesse James family, he made claims that were not substantiated. When promoting the artifact on its web site, the auction firm furthermore relied upon and created fictionalized history, to promote the questionable artifact for auction sale. Eric F. James had no difficulty pointing out what he perceived as significant discrepancies in Meguiar’s image and claim. James is the genealogist, family historian, and archivist of an archive of family documents pertaining to the Jesse James family. 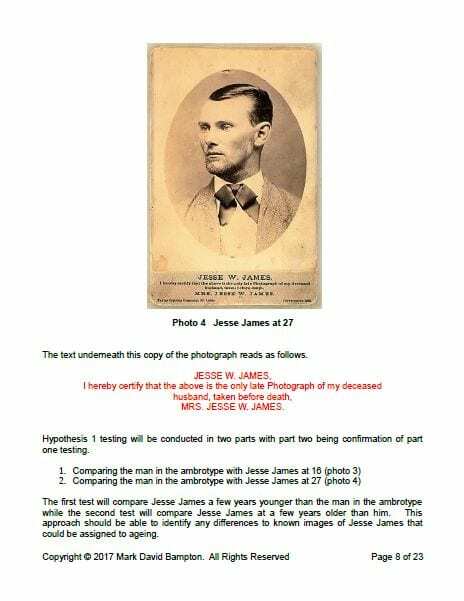 His archive includes 250 years of authentic James family images, plus an extensive archive of images that have claimed to be Jesse James or his brother Frank James, collected over the past 150 years. 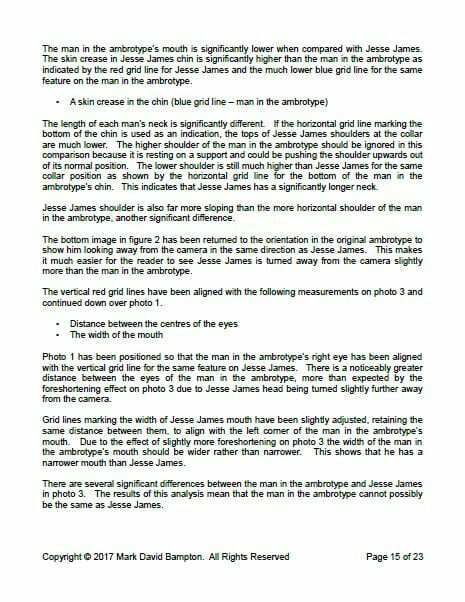 Recently, James produced a video showing the genetic physical characteristics of the men of the Jesse James family. On average, James receives 3-4 claimed images every month. Most all of them never are subjected to forensic science analysis. 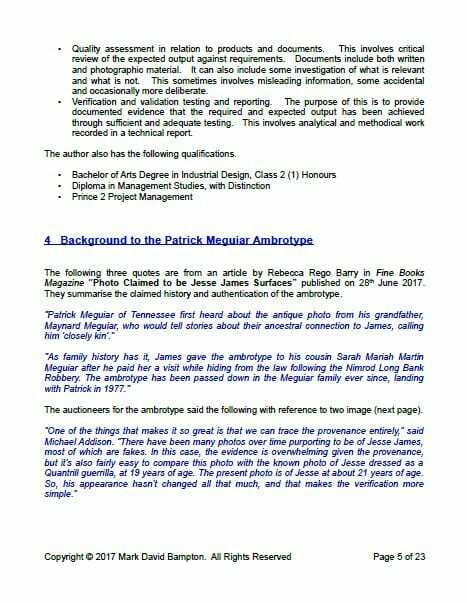 Writing to Patrick Meguiar, James was quick with his replay and opinions. 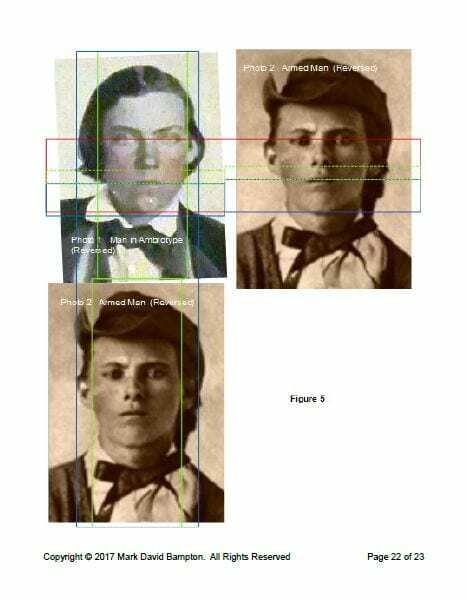 “Attached you will find a side by side comparison between your image and one of Jesse James. “To the untrained eye, it would appear easy to see why your image might claim to be that of Jesse James. However, when left to scientific forensic analysis, there’s much to be said. I will simply address those particulars identifiable to me. “Clearly, these two subjects are not the same age. Jesse James is about 16 when this image was taken. The subject of the claimed image appears to be almost a decade older at least. Forensic analysis would take this into account. Still, enough physical features can be compared. 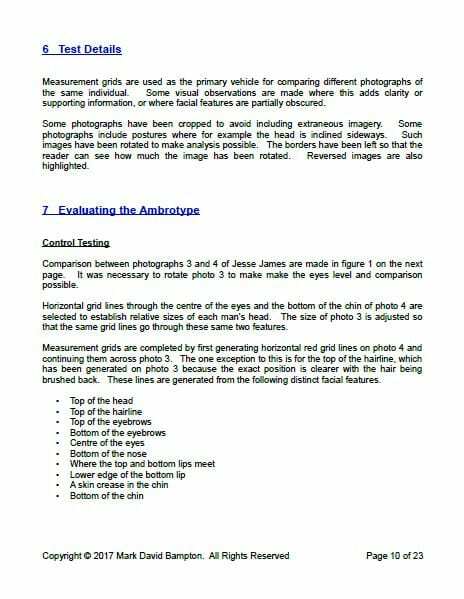 “The forehead in a professional analysis would be measured for comparison of mathematical spatial metrics. From my view, they appear similar, but each displays a different hairline. There also appears to be some spatial formations that do not comport. The JJ image is broader. The claimed image appears more narrow in compactness. Again, mathematical metrics would measure this very precisely. “The eyebrows are dissimilar. 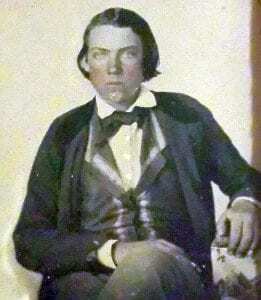 Typical of the Jesse James family, one eyebrow is arched and the other curved. Both are arched severely in the claimed image, very unlike any image to be found among the archive of images from the James family. “The eyes are shaped differently in each. However, JJ’s eyes are more deeply set, more round than almond, and are not subject to as heavy an overhang of fatty eye tissue. The spatial relationship of the eyes to the nose also differ. 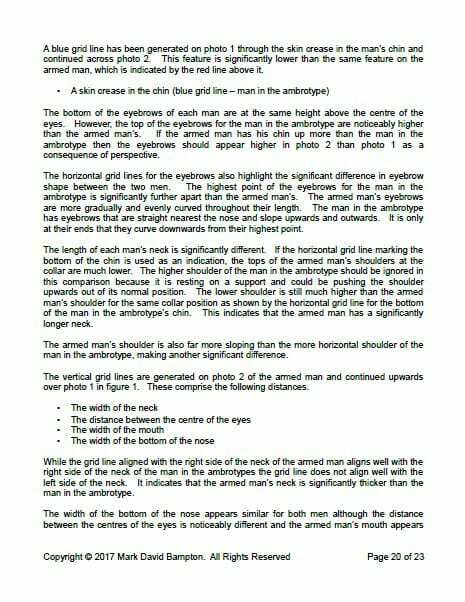 Email of Eric F. James written to Patrick Meguiar, addressing the image discrepancies James perceived in Meguiar’s claimed ambrotype. 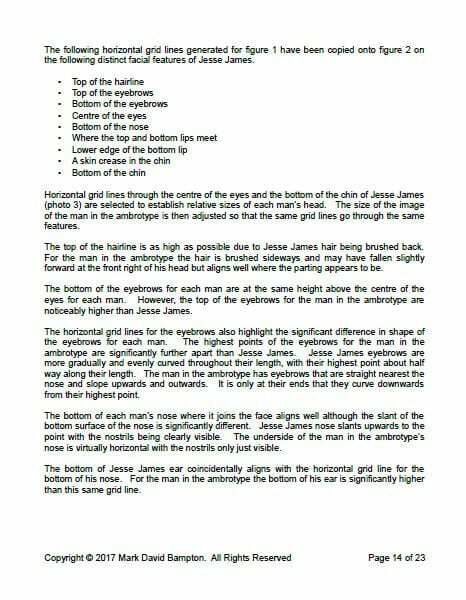 “The noses differ also, JJ’s being longer with the typical James base that arises up and forward from the area above the lip. The base of the nose on the claimed image does not rise, nor is it as widely spaced. The spatial relationships between lower nose and upper lip also differ. “The cheekbones differ, too. By the time JJ was the age of the subject in the claimed image, his cheekbones would grow more pronounced.than that of the claimed subject. 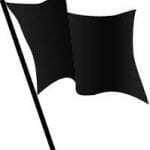 They also are more widely set. The same could be said of the upper jawbone, which among the James is as pronounced as that of the claimed image. “Below the nose, the most telling discrepancies appears among the base jawline, jaw formation, lip formation, and their spatial relationships. Unlike the flat horizontal lower jaw of the James, the claimed image displays a rounded jaw line and bulbous jaw. The typical lip formation of the James, evident in the JJ image, of full lower lip and an indented upper lip drawn very widely beyond the width of the nose formation, does not appear the same in the claimed image, which is tight, lacks definition, and is no more wide than the width of the subject’s nose. No James image displays such a narrowly drawn lip. “Below all this is the neck, JJ’s neck being elongated like most among his family, and the claimed image displaying a truncated neck depth. A comparison of the initial perception by James with the measured and scientific analysis by Mark David Bampton reveal the two, not only arrived at the same conclusion, they arrived at the same conclusion for virtually the same reasons. Neither James nor Bampton had conferred with one another beforehand or during their independent analysis. HOVER over paper for directional pages. 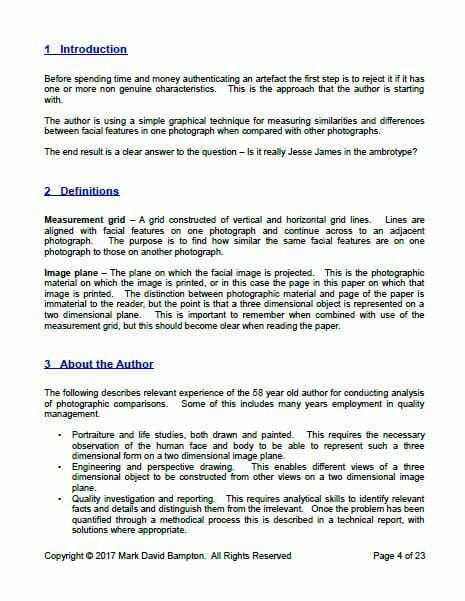 DOWNLOAD Mark David Bampton’s paper in pdf format. 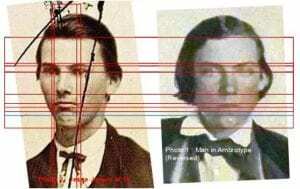 Initially, James casually considered the man in the ambrotype might be William Clark Quantrill under whose black flag Frank and Jesse James briefly served. Upon closer examination of his archive of authentic Quantrill images, James discarded the thought as improbable. Following his reading of Mark Bampton’s paper, James revisited the question of who the man in the ambrotype might be. 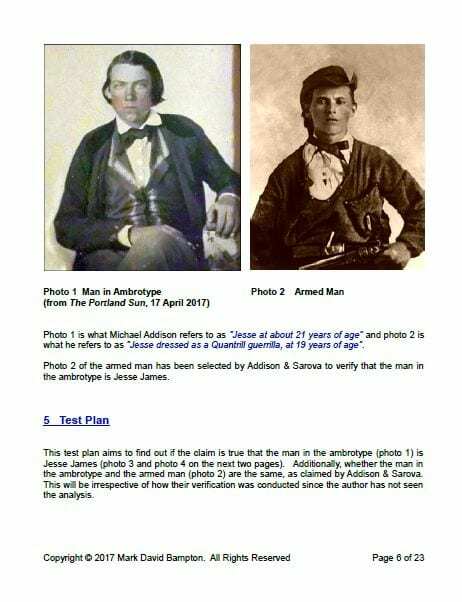 A comparison of an image of Patrick Taylor Meguiar with his childhood image plus an image of Patrick Meguiar’s father, leads James to suspect the man in the ambrotype is a relative from Meguiar’s past. When James compared historical images of Patrick Meguiar’s, he noted remarkable similarities among Meguiar’s legitimate ancestors and the man in the claim image. None of the legitimate ancestry of Patrick Meguiar was known in the period to the ancestry of Jesse Woodson James. 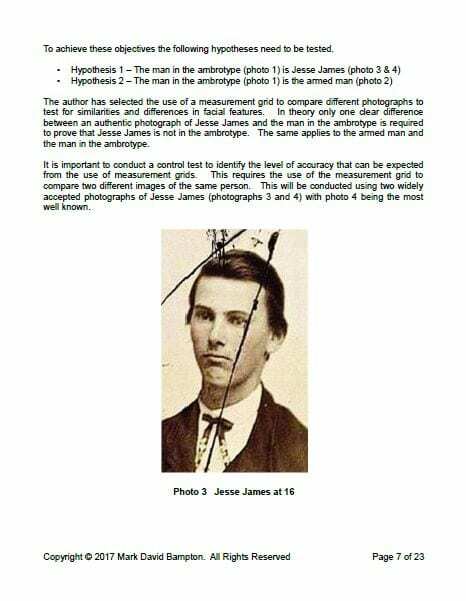 James knows that forensic science has proved the man in the ambrotype is not Jesse Woodson James. 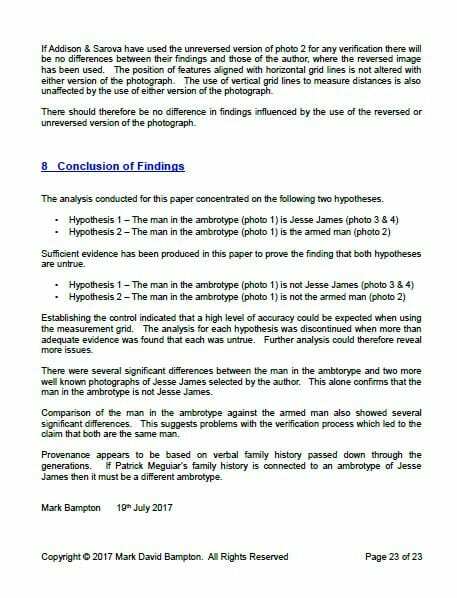 The evidence and proof made public in Mark Bampton’s independent forensic analysis report is available for anyone to see. 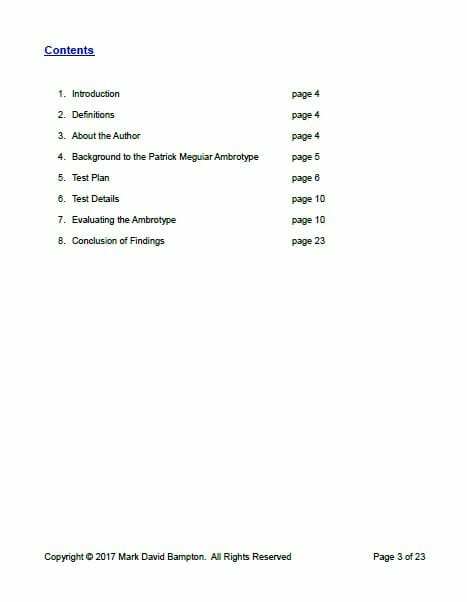 What remains unseen is the evidence and proof of Patrick Meguiar’s claim. Patrick Meguiar still must prove who is the man in his ambrotype. In his forensic analysis, titled “Jesse James, Robert Ford, and the Tintype,” Great Britain’s Mark Bampton poses his question about the controversy in typical British fashion – as a pun. Mark Bampton lives in Ampthill, which he describes as “a small Georgian town” in Bedfordshire, Great Britain. 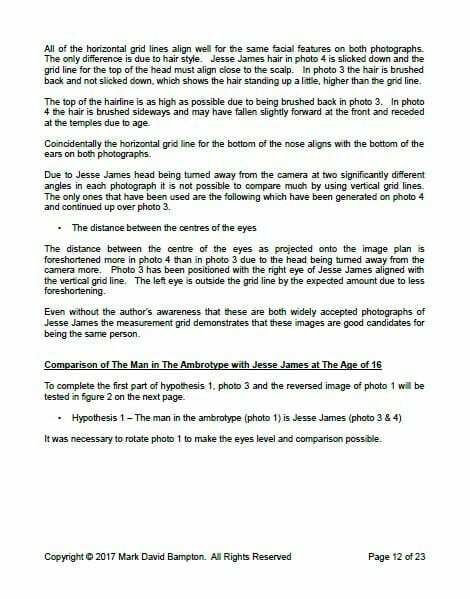 Prompted by the reaction of the Jesse James family to the Bob Ford/Jesse James photo hoax, promoted by Lois Gibson and Sandy Mills and their circle of supporters, Mark Bampton decided to apply his own scientific forensic analysis to the image controversy. Not surprisingly, Bampton arrives at a different conclusion than Lois Gibson. Instead of artistry, Bampton applied the sciences of mathematics, linear technical analysis, and measurement testing. These are the same skills Bampton employs as a product engineer. They also are the skills that a trained scientific forensic scientist normally would apply in the formal analysis of an historical image or artifact. 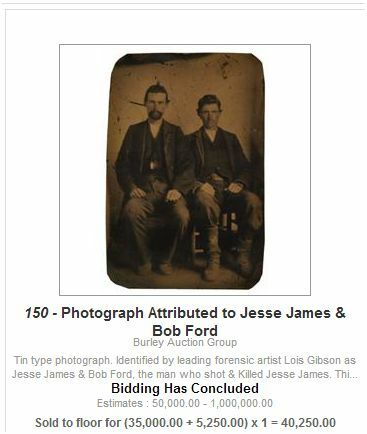 Bampton soon discovered the reason why Lois Gibson would authenticate the claimed Bob Ford/Jesse James tintype. when he read another article written by Dr. Bruce Conforth, that also was published on Academia. 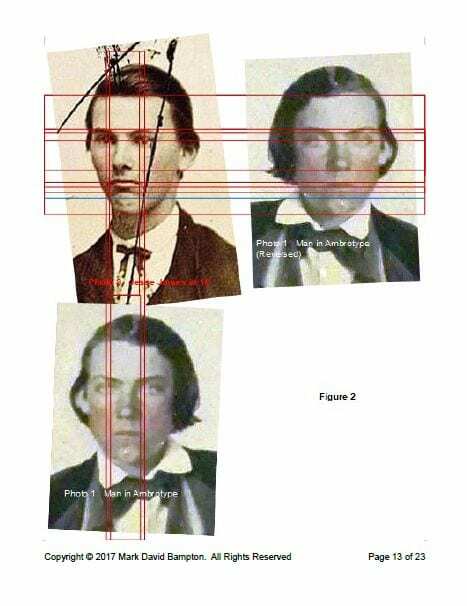 In writing “A New Analysis of the Two Accepted Photos of Robert Johnson and the Alleged 3rd Photo,” Dr. Conforth lays out the story of the Johnson image, its discovery, and Gibson’s record of association with it. This article followed two previous publications by Conforth. 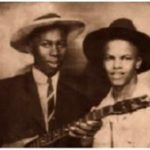 “Another Robert Johnson Photo Debunked” documents Conforth’s disgruntlement with the fakery surrounding the Johnson image. “The Business of Robert Johnson Fakery” is another Conforth article published in Living Blues magazine. To Mark Bampton, the Conforth’s story already was a familiar one. 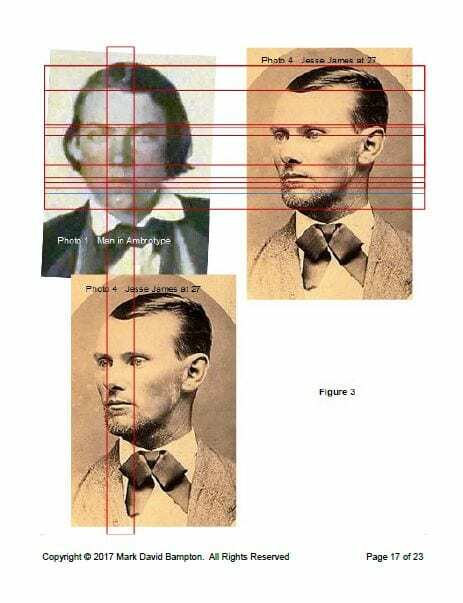 Dr. Conforth’s story of the Johnson image reflected almost precisely the sad saga of the Bob Ford/Jesse James image as related in the James family’s rebuttal to Gibson’s authentication. 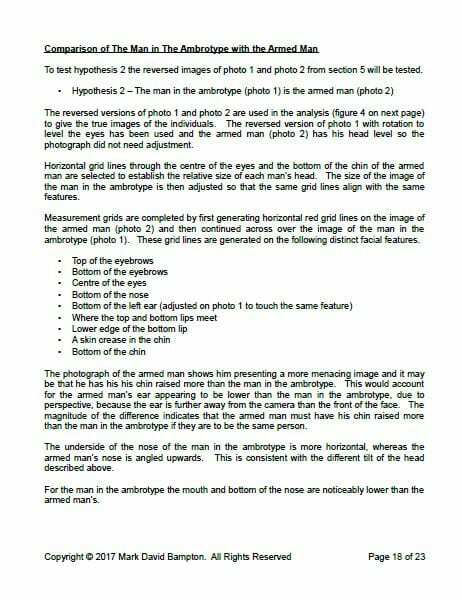 Very familiar to Mark Bampton was the linear forensics applied to the Johnson image, that appeared in Dr. Conforth’s treatise. 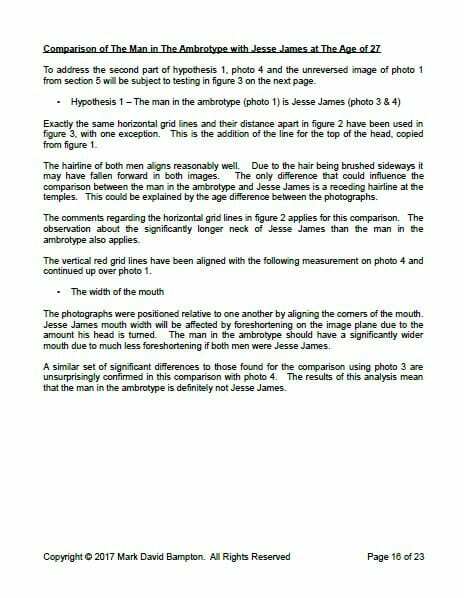 Bampton decided to apply his own forensic skills upon the assumptive Bob Ford/Jesse James image. 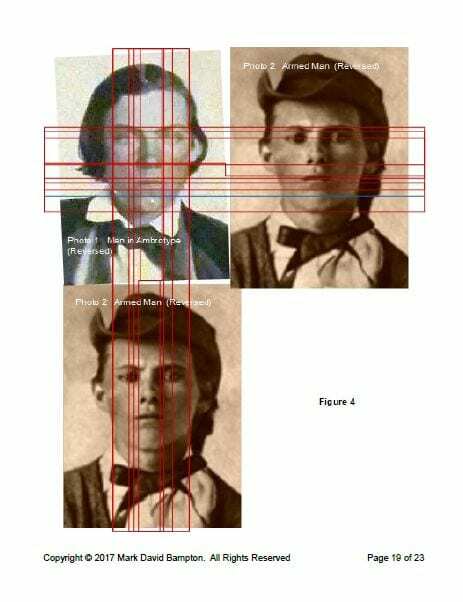 Linear forensics applied by Mark Bampton to Lois Gibson’s alleged authentication of the claimed Jesse James image yields numerous discrepancies that are plainly visible. Using several applications of linear forensics, now fully and clearly outlined in Mark Bampton’s documented report, discrepancies proved to be multiple and evident. Not only were discrepancies revealed in the conjectural Jesse James image, they also became evident in Gibson’s uncertain Bob Ford image. 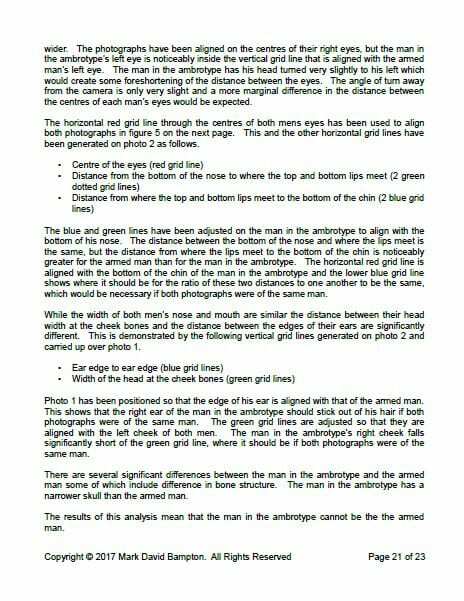 Linear forensics applied by Mark Bampton to Lois Gibson’s alleged authentication of the claimed Bob Ford image yields plainly visible discrepancies. Mark Bampton registered shock when told by the James family that Sandy Mills’ tintype had sold at auction for $35,000, plus auction fees. The James family was informed of the sale by two regular attendees at Burley Auction Gallery events. The regulars stated that the prize bidder was not recognizable and was unknown locally. The James family alleges that the fraud that is evident in Gibson’s hypothetical authentication may extend to the auction, too. Prior to the auction, Stray Leaves publisher, and Jesse James family biographer Eric F. James was contacted by the Houston Chronicle to schedule an interview following the auction. Given the very surprising outcome of the auction, this result should have made a gigantic news story, attracting worldwide attention. 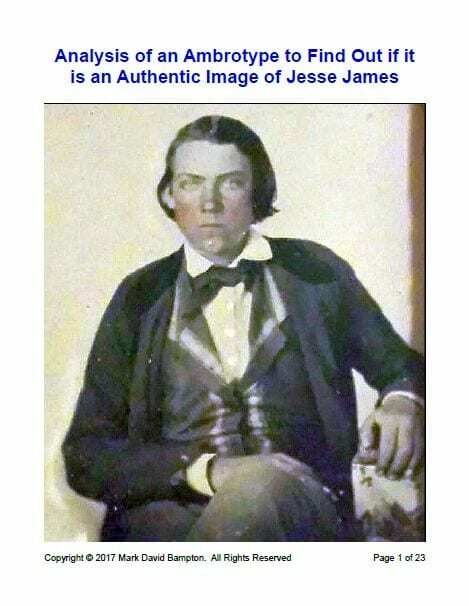 No historical image of Jesse James or the James family has ever sold for more than two thousand dollars. Eric F. James is perplexed that the Houston Chronicle did not follow through and interview him afterward as planned. Nor did the newspaper report on the auction outcome as it had planned. This was even more perplexing given the fact that Dylan Baddour of the Chronicle had broken the story initially about the pretentious tintype. Baddour previously also reported on Gibson’s alleged authentication of the Robert Johnson image. Not willing to accept one piece of oral testimony about the auction result alone, Mark Bampton uncovered secondary evidence of the auction’s outcome on icollector.com. Of course, no evidence remains that the purchase money actually was paid, the image transferred, and the sale concluded. Nor has the winning bidder been publicly identified following the acquisition of such a prized auction artifact. Those unknowns in itself guarantees that this story will continue to be a controversy for a long time to come. 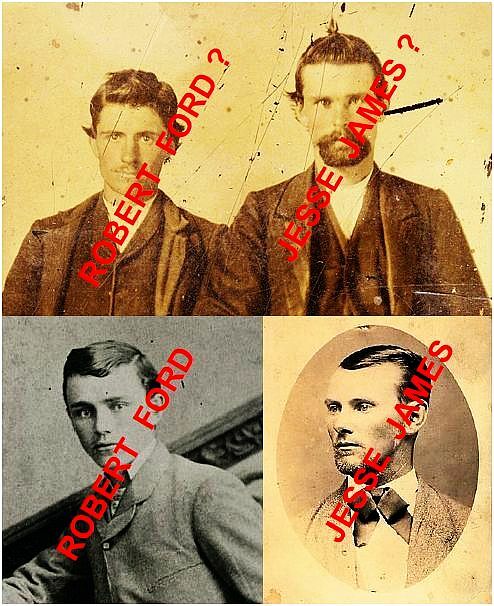 The literal answer to the pun is a fake Bob Ford, a fake Jesse James, and two authentic images of them. The non-literal answer is, whoever has benefited the most financially or in publicity from the promotion and sale. Among Lois Gibson, Sandy Mills, the auction house, and the Gibson-Mills ring of partners and supporters, a lot of unknown information remains. Ample room for conjecture is left. The wealth of criticism leveled at this controversy will not abate soon, at least not until the pun of the question finds authenticatable answers. This fall, Mark Bampton will visit America to present his paper on “Jesse James, Bob Ford, and the Tintype” before the James family, their friends, and associates at the annual conference of the National James-Younger Gang Inc. 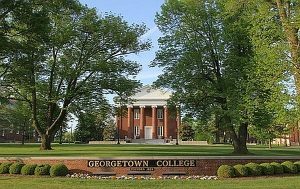 The conference will be held in Georgetown, Kentucky. The public is welcome to attend. 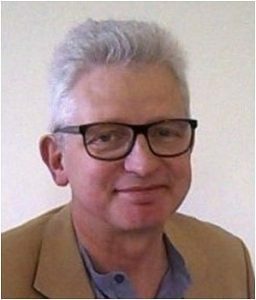 MEET Mark Bampton: SIGN UP for notices to attend & meet Mark Bampton at the James-Younger Gang 2017 Conference. FREE DOWNLOAD: Mark Bampton’s entire paper now appears on the Academia website and also is free for download HERE.